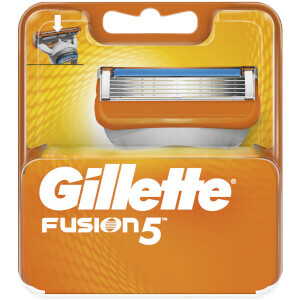 Gillette Fusion5 ProGlide Power razor for men features 5 antifriction blades for a shave you barely feel. With FlexBall technology, it responds to contours and gets virtually every hair. Battery-powered soothing Micropulses help the razor’s blades move effortlessly. The Precision Trimmer on the back is great for hardto- reach areas and styling facial hair. One razor blade refill equals up to one month of shaves. 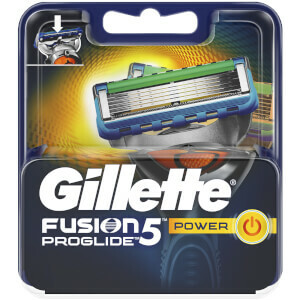 Fusion5 ProGlide Power men's razor fits all Fusion5 blade refills. Gillette razors, formerly called Fusion ProGlide Power. Having been disappointed with short life of Sensitive blades for Gillette manual razor I tried main competitor: Hopeless! Discovered Fusion Proglide Power: FANTASTIC! This is a terrible razor and I wish I just brought the standard again... I had previously owned the proglide power and upgraded to the flexball version to find it has less power and more drag. My previous razor was a little faulty but upon testing the 2 together I found the flexball version to have insufficient power and does not vibrate as much as the previous version. If you want a good razor stay with the original fusion proglide power, dont buy this piece of terrible technology. i always use Gillette Razors and didn't think it could get much better than the Proglide but i was wrong, i was brought this by my wife and couldn't wait to use it and i was not dissapointed, it is the most comfortable shave i have ever had and it felt so much easier to use i was actually surprised at how quickly i finished shaving, this razor definately shaves more hair per pass than previous razors. i would definatley recommend this to anyone who will listen and thank you Gillette for inventing this, it is a huge improvement on a razor that i didnt think could be improved.